You can go to your local Dodge dealership today and order a 2019 Charger SRT Hellcat, but you cant look up the pricing on the company website yet. The dealership will be able to tell you how much everything costs, but right now, it is hard for prospective buyers to price out their ideal supercharged sedan. Fortunately, someone sent me a Dealer Order Guide for the 2019 Dodge Charger, meaning that I have the full pricing details for the 707-horsepower SRT Hellcat package and it just so happens that for the new model year, the base price is dropping a bit. The 2019 Dodge Charger SRT Hellcat has a base price of $65,345, down from $66,295 in 2018. It appears as though Gas Guzzler Tax and Destination Fees will remain at the same $1,700 and $1,395, meaning that the 2019 Hellcat sedan’s “out the door price” is $68,440. Compare that to the true base price from 2018 and you have a price drop of $950. As some of you might recall, the base price for the 2019 Challenger Hellcat dropped by an even larger margin, but for the new model year, the Challenger comes with standard cloth seats while the Charger still comes with standard leather. However, it does appear as though Navigation is no longer standard for the 2019 Charger, as it is listed as an $845 package, so there has been some “de-contenting” to lower the price of the sedan as well. Even with that in mind, a lower base price is always a good tool to get people in the door, allowing those who want to spend more money to load up their cars during the order process while allowing others to save a few bucks. 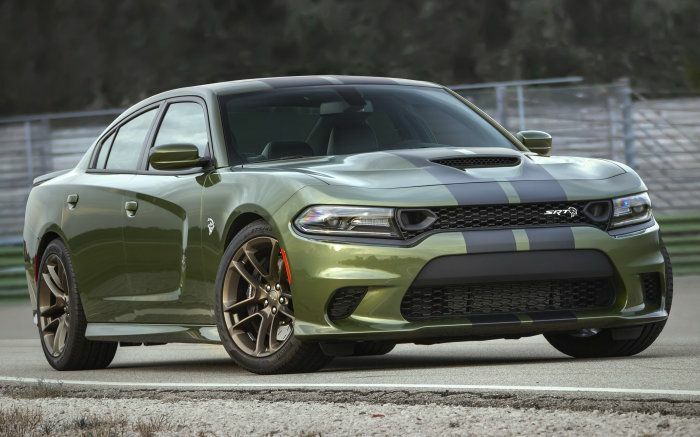 The following options for the Dodge Charger SRT Hellcat have remained unchanged for the 2019 model year. -Black, Grey and Orange Brembo brake calipers are still $495 while red is standard. -The engine block heater is still $95. -The Pirelli P-Zero summer tires are still $595. -The dual stripe package in black or carbon fiber is still $995. -The Black Painted Roof Package is still $1,500. -Red Seat Belts are still $195. -Opting for red leather interior is still $295 while black and sepia are available at No Charger. -The Brass Monkey Painted wheels are now $1,195, up from $995. -Alcantara was a free option in 2018, but for 2019, it is part of a $695 package. -The Sunroof Package was $1,500 for 2018, but for 2019, it is $1,995. Fortunately, the Harmon Kardon speaker system declined in pricing from $1,995 to $1,795 and new for 2019 is a Black Satin Hood Package that costs $1,995. So, if you are planning to order a 2019 Dodge Charger SRT Hellcat with the Harmon sound system and navigation, but without the sunroof, Alcantara or Brass Monkey wheels, are you going to pay less for than you would have for the same car in the 2018 model year – discounts notwithstanding, of course.